Web Hosting is already full of companies serving different kind of customers and websites, every single day we are looking for the best vps provider there is. In this review, we will look at DigitalOcean’s history and what makes them better from the rest of the web hosting companies. 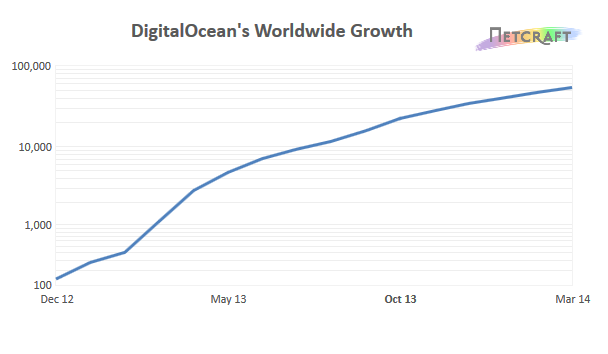 DigitalOcean is one of the big starup success stories of 2013, earlier this month (February), the company announced that they had raised a whooping $37 million funding by Andreesen Horowitz. This is after raising a $3.2 million seed round, not to mention that they are getting 1,000 new customers every single day which is now spun to over 1.3 million cloud server since last year. I went ahead and signed up with DigitalOcean SSD Cloud $5/ month, and it has been a great all day! Considering the amount of resources that I needed for my blog, the SSD Cloud hosting is superb. TechCrunch published a detail post about their startup journey which is really inspiring about their struggles to get the company moving. Full credit goes to TechCrunch! I also I added the videos on the post, watch it to know them better. How DigitalOcean ranks with Other VPS provider? Lowendbox.com recently launch a toll for 2014 Q1 on whose the most used VPS server provider and DigitalOcean ranks #8, which is pretty cool since most of the users are happy with their service. This proves that they are doing something right for their customers, most of them are quite satisfied with them. Netcraft conducted a survey in March, 2014 – and as of then, DigitalOcean is ranked as the 9th most popular hosting platform in the world. I believe that their platform is still in infancy, and has a lot of room to grow. During the writing of this post, DigitalOcean is powering over a million cloud servers, that’s a whopping number that many hosting companies have dreamed about and failed to achieve. Check out the rest of the results on this blog post. This is really an inspiring post! Just visit their site DigitalOcean and sign up with an account. It’s free to register, but if you want to create a server, you’ll need to enter your billing details first. We will use paypal simply because it’s easier to manage all my hosting transactions there. Simply buy credits(at $5, $10, $25, $50, $100 options) which will be consumed by your account based on what you used. After entering your payment details, we will create a “Droplet”. 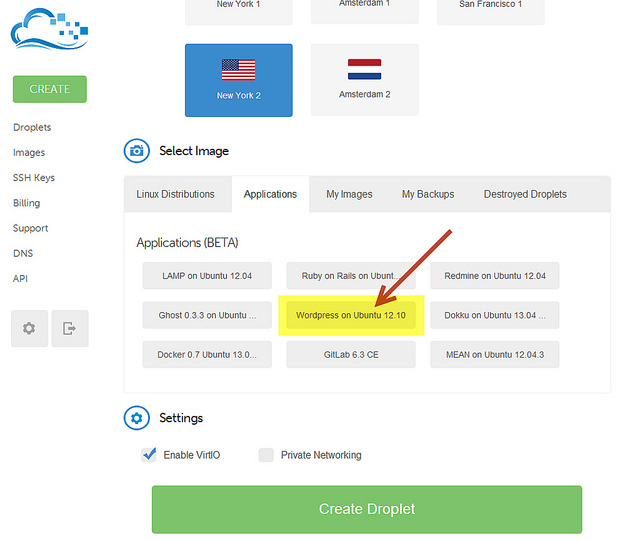 Droplet is similar to a VPS where you include all your website files, database, etc. Uou can use one droplet for one website. 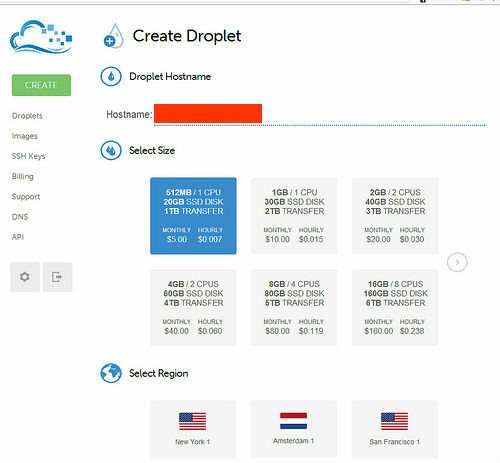 Although you can configure a custom droplet and host several websites, we won’t be covering that today. The reason that we want to create one droplet for each website is because we want to spend only $5 per month plan, on the other hand some sites that have more bandwidth and traffic requirements might need $10- $20 / month or maybe more. The next option is to select the region you’d like your server to appear in. We’ve selected New York, but you’re welcome to choose whichever you like, and it will usually come down to your own nearest location, all of the locations provide great speeds to the whole world, no matter what. The last thing to do is to select an server image that you’re going to be working with for the time being. If you’re new to cloud hosting, it would be wise to do some research, as to which of these images are best for you. I’m pretty sure that Ubuntu is beginner friendly, though it’s worth paying attention to the ‘Applications’ tab, which will enable you to build pre-customized servers, saving you quite a bit of time when it comes to installing a web server. Select any of these from within the Create Droplet -> Select Image -> Applications tab, and you’ll have a fully functional server with your application of choice, created by DigitalOcean itself. You’ll receive a root password in your email address, a few moments after you click that big, green button. It doesn’t get any easier than that, and if you thought it looks complicated, it’s only because I’ve tried to account for all of the features that are available to the customers. This ends the tutorial on how to get an account and get started on DigitalOcean. Any questions about this whole process, leave a message in the comments, and I’ll try and do my best to help you out. It’s faster – your website and files are hosted on SSD (Solid State Drives) that are faster than ordinary hard drives, making your site load faster. It’s economical – you pay only for what you use and consume. What’s the Catch at using DigitalOcean? I believe the only catch is learning a little bit of Linux and understanding UNIX programming. Taking a weekend off just learning these and also make sure you read a lot about server security management, it helps a lot! Do I need to know UNIX inside out? Not really, just some parameters to do in your server. Like adding emails, PHP extensions, adding Cpanel and those little task. There’s more you can do with Cloud Server, but if you’re a beginner and in a hurry, it’s better to get the Cpanel and do other advance stuff. That is why I only recommend that you use the application installation with WordPress. Is DigitalOcean a Good Option? Yes, absolutely! The beauty with using them is that you can quickly create droplets, delete them and restore them. If your stuck, their community articles are really helpful. Hopefully, if you just need to install WordPress, then this article would be sufficient. VPS Hosting vs Dedicated Hosting, Which one should you Choose?